Once a family is connected to Baby University, our vision is to provide the best educational options for them in an effort to break the cycle of generational poverty in South Toledo. 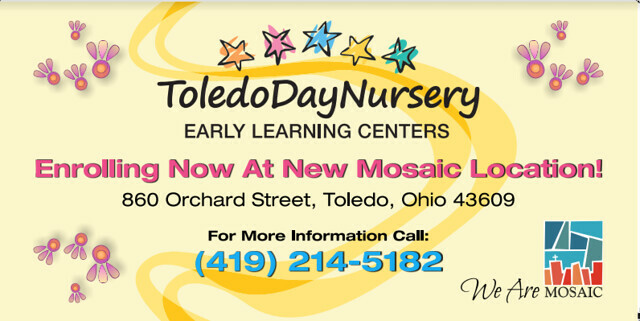 Toledo Day Nursery is one of the nations oldest and best Preschool Providers. Their accreditation is in the top 7% of the nation. Their long term mission and commitment to providing high quality, affordable preschool to those who need it the most makes them an excellent partner for the South Toledo Kids Zone pipeline. Would you like your 3-5 year old to thrive in Preshcool? We are now enrolling! We are also partnering with Toledo Public Schools to bring two Head Start classrooms to South Toledo! Head Start programs promote school readiness by enhancing the social and cognitive development of children through the provision of educational, health, nutritional, social and other services to enrolled children and families. Head Start engages parents in their children's learning and helps parents in making progress toward their educational, literacy and employment goals. Prior to this, there were no Head Start classrooms in South Toledo. Now qualified Baby U families can attend Head Start in their own neighborhood!